Residents of four Rayong neighborhoods celebrated the start of the new rice-planting season with the traditional roasting of 999 bamboo-wrapped servings of sticky rice. The Feb. 16 ceremony in the Klong Namhu section of Neonpra sub-district saw residents of Koh Kok, Nogtangmae and Nongnamyen join their neighbors to prepare the 100-meter-long dessert tray. Village Chief Somkiat Charoensap said the tradition began in Buddhist teachings and is done at the start of the new planting season in the third lunar month to show gratitude for the previous harvest and pray that the next one would be as good. 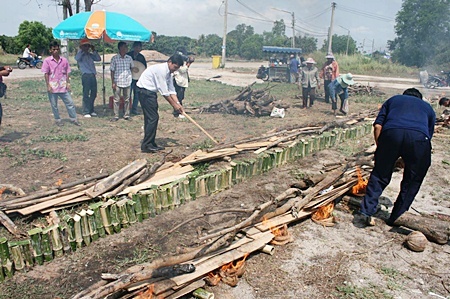 Men pour the sticky rice into the bamboo in preparation of roasting. 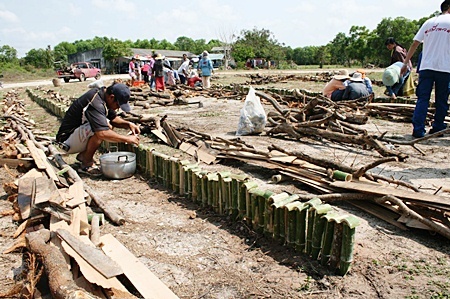 Residents work in unison on the merit-making project, with men cutting the bamboo poles into the desired sizes, cutting it at each joint to prevent leakage. Meanwhile, the women soak the sticky rice, grate the coconut and season the batch into three desired tastes: sweet, greasy and salty. The rice is then added to the bamboo and roasted. This takes place the day before Makha Bucha Day, and is referred to as Shaving Day. The rice is then brought to the temple. The dessert is then roasted to perfection.